Mining for new prospects is often the most important goal of trade shows. One of the benefits of exhibiting at an event is you get face-to-face interaction. You can dive in to understand your prospects’ business and what’s in their pipeline from a marketing/events standpoint. As part of those conversations, and even before them, you’ll need a good tactic to initially get attendees to stop at your booth. Building brand awareness is an important part of trade show exhibiting. So how to do that? One answer is with promotional products, that can help you remain top-of-mind with prospects and loyal customers alike. Did you know that according to PPAI, approximately 82% of people have a more favorable impression of a brand after they receive a promotional item? 4) won’t bust your budget. Stocking your booth with giveaways that are useful is vital. Free gifts draw people to any booth, but practical gifts, those giveaways your audience will actually use, allow your sales team to easily pitch the usefulness of your company’s products and services. 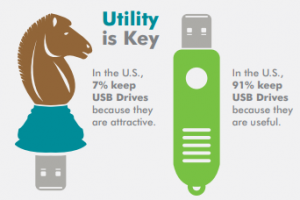 According to ASI, 91% of people in the US keep USB Flash Drives because they are useful. Outfitting your exhibit with useful gifts, ones that are not the latest gimmick, offer a long shelf life to your giveaways. Go ahead and order the maximum quantity to save money in the long run! Items like bags, cellphone wallets, hand sanitizers, microfiber cleaning cloths and can coolers will always fulfill whatever promotional need you may have in the future. These enduring products are relevant for all seasons of the year. Choose a product that will easily tie into any of your company’s promotional themes or marketing campaigns. As an example, if your company’s industry is hotel/tourism – luggage, luggage tags and business card holders easily fall in line with that theme. 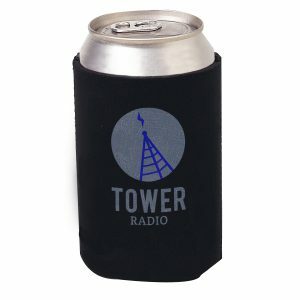 Depending on your organization’s unique branding or selling points, you’ll find a number of timeless promotional products to fit the bill. Each trade show venue gives a vendor a pre-determined amount of booth space. This acreage is valuable! Small space-saving promo products utilize your surface area in an efficient and organized manner. After all, you came to the trade show to sell, not just give away branded merchandise. Compact promotional products use an appropriate amount of space without distracting from the content that matters most to your company! Our favorites this year: Webcam Covers and Popsockets. With so many people having multiple smartphone devices, these items will surely get used and your brand will be in your customer’s face – literally. Other space-saving swag includes travel-friendly option such as pens, carabiners, note pads, and key chains. Trade shows are valuable because they give you face-to-face time with your prospects and customers. Impressive, budget-conscious products that capture the right person’s attention are pure gold! ePromos offers a huge selection of items under $1 that are great staples to use any time. Now that we’ve discussed the ways trade show items can be classified, let’s explore some options that fall into these categories. Not only are all the items featured below useful, timeless, space-saving and budget conscious, they are also tried and recommended by our customers. Bags are a great conversation starter because everyone, and we mean everyone at a trade show, will need a bag to carry all the swag they are collecting. Not only are our custom tote bags a fun way to say, “Thanks for stopping by!”, but you can ensure your company’s information finds its way back to the attendees’ offices by pre-stuffing the bags with promotional literature. 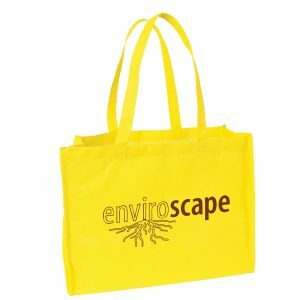 The tote bag we’ve chosen to highlight is a durable, non-woven bag that comes in colors to match your branding: yellow, burgundy, navy, black, orange, purple, red, reflex blue, white, lime green, pink, hunter green and light “Carolina” blue. We guarantee you will get the most out of your trade show investment when you showcase your brand on the front of a tote bag! Budget-conscious price: as low as $1.15! From industry expos, to commercial shows, to corporate events, any kind of promotional incentive is a proven traffic booster for your trade show booth. However, can coolers are fun giveaways that trade show attendees will bring to the next tailgating party or home to a family member. Either way, your brand becomes memorable. And, brand recognition is the name of the game! This lightweight can cooler is a great insulator with laminated open cell foam. It folds flat for easy storage in a pocket or purse and can be inexpensively mailed to prospects. Choose from 22 colors: black, brown, camouflage, fuchsia, green, hot pink, khaki, light green, navy, lime green, orange, pink, purple, red, royal blue, burnt orange, turquoise, yellow, burgundy, white, light blue and gray. Budget-conscious price: as low as 55 cents! People don’t go anywhere without their cellphones. Most of us believe we couldn’t live without them. So, what’s the perfect giveaway? A Custom Wallet for Cell Phones. This slim, silicone pocket attaches to the outside of any mobile device and is perfect for storing a driver’s license, credit cards, hotel key, business cards and cash. These tiny tools will be taken everywhere, which means more visibility for your brand. 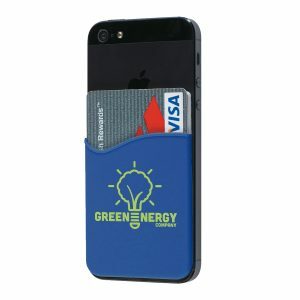 Just imagine how many times a day your logo will be seen, the possibilities with a cell phone wallet are endless. This wallet adheres to the back of a cellphone with a strong adhesive that won’t leave marks or residue after being removed. Match your logo to our blue, black, gray, white, lime, orange, pink purple, red, yellow, burgundy, green and navy wallets. Budget-conscious price: as low as 99 cents! Few promotional products are so small, yet so beloved. Our lightweight, inexpensive and attractive cloths will clean every delicate screen made today. Not only are they great for electronic screens, they’ll clean glasses and sunglasses too! 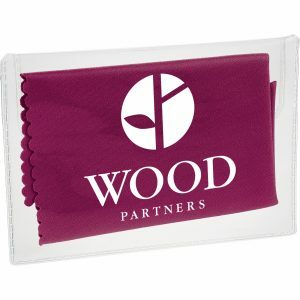 Your logo will be visible on the brightly-colored cloth through the clear storage pouch. This customer favorite is available in 8 colors: khaki, lime, burgundy, green, gray, orange, red and blue. This practical accessory will give you the advantage of a little extra something and reinforce your brand. Microfiber cloths are not just a trade show-only investment. Stock your whole office with them and hand them out to new hires. Budget-conscious price: as low as 65 cents! Tradeshows involve an insurmountable amount of handshaking. Your giveaway will be used right away at the event, giving your brand immediate credibility. This bestseller promotes overall health along with your business. 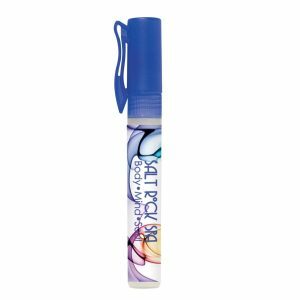 You can put your full-color logo on the container and wrap the graphics all the way around this hand sanitizer spray. Sanitizing sprays are more convenient than other sanitizer products such as hand wipes. This spray has .27 ounces of lightly-scented disinfectant effective at eliminating over 99.9% of germs and bacteria. The container, made of durable plastic, easily fits in a pocket or purse and has a convenient pocket clip. Budget-conscious price: as low as 85 cents! We hope you found these recommendations useful for solidifying existing affiliations. If you need more ideas or inspiration, contact one of ePromos Brand Consultants. Don’t forget, we are “the promo know-how people”!